A manuscript is reviewed for publication in “H-2000 Independent Reviews” on the understanding that it has not been submitted simultaneously to another journal, has not been accepted for publication elsewhere and has not already been published. On acceptance, a manuscript becomes the copyright of H-2000 Independent Reviews. Manuscripts are subject to peer review but the Editor reserves the right to make the final decision regarding publication and to make literary amendments where considered necessary. “H-2000 Independent Reviews” accepts the criteria for authors proposed by PM & DC. A covering letter signed by all authors must accompany submissions, stating that all authors have seen and approved the manuscript and are fully conversant with its contents. Authors must disclose in the covering letter any potential or actual personal, financial or political interest they may have in the material. We aim to reach a decision on submitted articles within 8 weeks. The Editorial Board does not necessarily agree with the views expressed in articles published in the Journal. 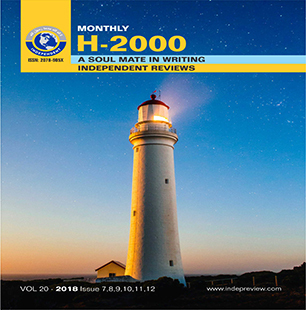 H-2000, Independent Review is a review journal of human sciences. It is non-political, being published for improvements and sharing of the knowledge with a hope to transform for future. Everybody is allowed free access to all parts of this publication: It may be reproduced, stored in a retrieval system or transmitted in any form by any means without prior permission. We provide updated information on various subjects of health sciences, encourage independentthinking & encourage younger graduates to write. We are here to highlight glorious past in the field of science, technology and provide a forum for the publication of guidelines for the management of common medical problems where learn and understand the recent developments in the field of medical sciences. Members Prof. Muhammad Saeed, Rahim Yar Khan. Prof. lrfan Ahmad Mughal, Foisalabad. Prof. Aamer Zaman Khan, Lahore. Copy Editors Dr. M. Badar Bashir, FCPS. Dr. Noor Akbar Sial, FCPS.